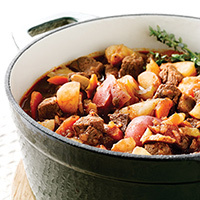 Originally a French peasant dish—this hearty stew will be met with approval on any table. In an 8-quart saucepan or pot, over medium-high heat, heat 1 ½ teaspoons of the oil. Add half the beef and cook, turning occasionally, until browned on all sides, about 5 minutes; transfer to a plate. Heat another 1 ½ teaspoons oil and brown remaining beef cubes. Add to already browned beef. Add remaining 1 tablespoon oil to pan and stir in the onion, celery, carrots, garlic, parsnip, mushrooms, and thyme. Cook, stirring occasionally, until vegetables start to soften, about 6 to 7 minutes. Meanwhile, scrub potatoes with vegetable brush under cold running water. Cut each into eight pieces. Add potatoes, beef and any accumulated juices, broth, wine, and tomato paste to the pot.